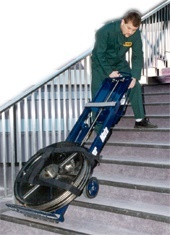 The PowerMate M-Series stair climbing hand trucks = heavy duty lifting! 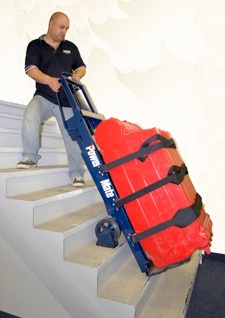 The PowerMate M-1 is a heavy duty stair climber with a capacity to move loads up to 1,500 lbs. The M-1 is made from heavy duty steel construction and is ideal for moving heavy loads like safes, boilers, geothermal heat pumps, elevator equipment or any heavy, awkward load. For a comparison of all our safety moving products visit our PowerMate products page. The PowerMate M-1 is four machines in one: a powered stair climber; a powered tailgate lift; a loading dock leveler and a well-balanced dolly. The following list provides a quick reference to some of the advantages attributed to the PowerMate M-1 stair climber. Does 100% of the lifting so you don't have to! A powerful labor saving device that can help reduce costs and contribute to profitability. Reduces property and product damage by keeping the load under control during the move. Contributes to your image of professionalism. Reduces the physical effort to move heavy loads by 87%. Contributes to jobsite safety by reducing jobsite injuries and injury claims. Tell me more about injury prevention and the potential savings I can expect by using a PowerMate on the job site. Moves heavy loads with half the labor! Jobs that required two people to move without a PowerMate now take just one! Jobs that previously required four people can now be safely completed with just two in most cases! Tell me more about Labor Savings. Carries the weight on the heavy duty outer frame which reduces the chance of bending or twisting. Comes complete with a built in 'hook bar lever' that can be used with an installed vehicle hook box to assist with vehicle loading. The Hook Bar also doubles as a leverage bar to assist with maneuvering heavy loads. Retractable wheels convert the M-1 into a four-wheel dolly which makes flat surface rolling a breeze! Customizable with a wide array of attachments including the 'Big Wheels' for rough terrain, snow and ice, sand or uneven ground. Comes complete with a full length bottom rubber guard that protects all surfaces during moves and also acts as an anti-skid contact. Has a 12v, 32 AH sealed gel maintenance free battery that is leak proof and will last on average from 4-7 years. 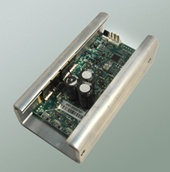 Together with our high-efficiency drive screw design the M-1 will move a 500 lb. load up AND down 20 flights of stairs on a single charge! Backed by the manufacturer! 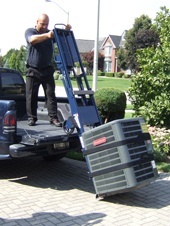 We not only provide stair climbers but also complete moving solutions including superior customer service and training. Our 1-800 number along with our load moving guidelines are prominently displayed on your PowerMate M-1. Our customer service personnel are always happy to help with on-site support. High capacity, high quality solid steel stair climber able to handle the most demanding jobs. Strapbars can be positioned strategically along the frame to secure various size loads. Every consideration was given to make your PowerMate the most ergonomically friendly lifting device on the market. For example, all our operator controls are strategically positioned on the top of the machine between the hand grips. The drive screw brake is always engaged until the operator activates the controls. This safety feature prevents unnecessary load movement. 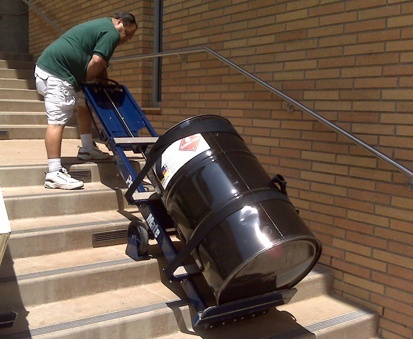 The wheels on a PowerMate lift up and out of the way reducing the overall footprint of the machine – ideal in a tight spot like narrow stairwells and landings. This feature is also why you are able to break back the load with such relative ease; with the wheels out of the way, the effort to pull the load back onto the wheels is dramatically reduced. Once the machine and load are back onto the wheels, you are now in a well balanced position - with no effort required to keep the load in balance! You can even let go of the machine at this point! A handy feature on stairwells should you have to open a door or even answer your phone. 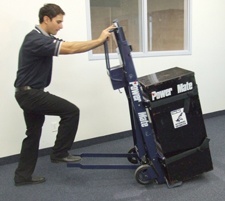 This is impossible with a regular hand truck and is a major advantage in owning a PowerMate. All PowerMates M-1's are manufactured with solid state controls which reduce the draw on the battery adding to your daily operational battery life. Another advantage of solid state controls (unique in the industry) is the "soft start" feature. This further increases safety by reducing sudden movements during start up and results in the smoother operation of the machine. The new controls also make servicing and maintenance as easy as 1 - 2 - 3! With the addition of the horizontal support brackets, the M-1 model can be lowered into a horizontal position. 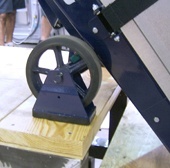 The load can then be easily moved higher up the frame to allow for the addition of a load elevator. 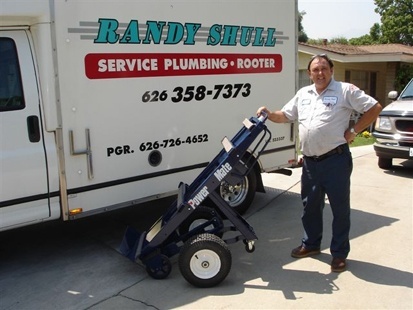 This is very handy for positioning heavy, compact loads like electric motors up into a well balanced position prior to the move. These quality features contribute to the lowest total cost of ownership on the market. To find out how an M-1, M-2B or M-2C will contribute to the safety and profitability of your business speak with a Solution Specialist today. 1-800-697-6283 or leave your contact information and a Solution Specialist will contact you at your convenience. The PowerMate M-1 is the machine of choice for moving heavy boilers out of residential basements in one piece. The M-1 is always in a balanced position, even while on stairs. Operators can let go of the machine to open doors or move obstructions - even answer their cell phones! This is impossible with a regular hand truck. The M-1 elevator package includes everything you need to move electric motors, test weights, cable and sheaves. 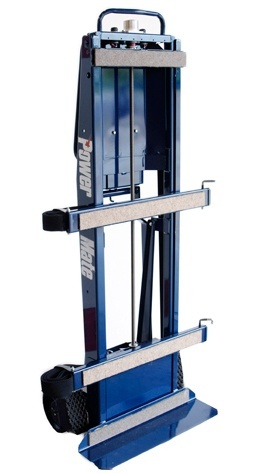 Contact PowerMate for more information on the M-1 elevator package. The M-1 comes with a leverage bar to assist with maneuvering loads. The leverage bar also works in conjunction with a 'hook box' that can be installed in the bed of your vehicle or loading dock to assist with load-in. The PowerMate M-1 is a tailgate lift able to raise and lower loads onto your vehicle beds and has a 40" lifting height! The PowerMate docking station is the ideal place to store and charge your PowerMate overnight. Store your PowerMate accessories and lock your station for security purposes. The PowerMate M-1 Stair Climber comes complete with: two strapbars, one hook bar, one 12V sealed long life battery, a battery cover, one two-wheel retractable dolly, and one battery charger with auto shut-off and multi voltage feature. Above weights are based on qualified operators moving loads that have the weight evenly distributed all along the frame. 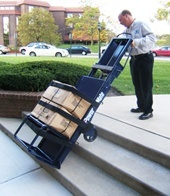 The PowerMate M-1 Motorized Stair Climbing Hand Truck. The M-1 comes complete with two strapbars, one 12V sealed long life battery, a battery cover, one two wheel retractable dolly, and one battery charger with auto shut-off and multi voltage feature, and one hook bar lever. Are you in the elevator modernization industry? Have we got the package for you! 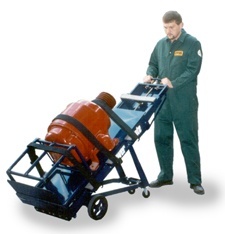 The M-1 elevator package includes everything you need to move all your test weights, sheaves, motors and tools. M-1's are the machines of choice in the elevator modernization industry. 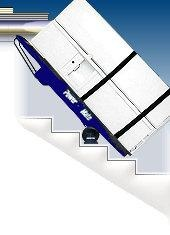 The M-Series stair climbers can be outfitted with wheel brake 'shoes' that provide added stability while on stairs and also further reduce the effort to move heavy loads (wheel brakes are a popular option with the M-Series machines). The M-1 Big Wheel attachment is the ideal solution for contractors that regularly need to move heavy loads over rough or uneven ground, even snow. The large air filled tires attached and remove easily to the fully loaded M-1. Also ideal for moving propane cylinders over grass or unpaved shipping yards. The PowerMate Hook Box can be installed in the bed of your truck, van or loading dock. Your fully loaded PowerMate is designed to work with your hook box to assist with loading heavy loads in and out of your vehicle. The hook box reduces the amount of effort required to hold a load secure while you 'power' lift your load.. The Cylinder Attachment is designed to hold barrels and compressed gas cylinders of various sizes securely in place. The Load Elevator is used with compact loads like heavy electric motors to raise the centre of gravity. This keeps the load in a better balanced position for stair climbing. 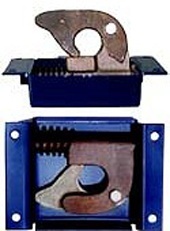 The Horizontal Support Brackets are used in combination with the Load Elevator and allow the operator to position the unit and load in the fully horizontal position. This allows the operator to re-position heavy loads higher up the frame for better balancing. The Extended Toe plate (in this case depth) is used with larger loads like commercial HWT to provide a larger base for tank legs. The Extended Toe plate (in this case width) is used with wide loads like vending machines to provide a base for the widely spaced legs. The In-Vehicle Charging System (IVCS) allows your PowerMate to be charged while inside your vehicle. The IVCS is a Smart Charger and will not allow your battery to drop below 75% of full charge capacity. Strain Out Of Moving . .
Leave your contact information here and a PowerMate Solution Specialist will contact you at a time that is convenient for you. The controls on the M-1 are weather protected, sealed switches easily accessible from the hand grips. 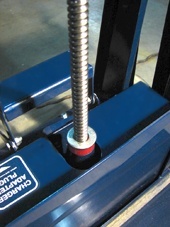 The M-1 PowerMate stair climber has a hardened steel, super efficient drive screw. The drive screw is 'right sized' with the 12V, 28 AMP power supply for peak operational efficiency providing long hours of operation between charges. The solid state controller and advanced microprocessor further reduces the load on the battery, extending your operational capacity. The microprocessor also provides a 'soft start' feature for smoother operation during start up. 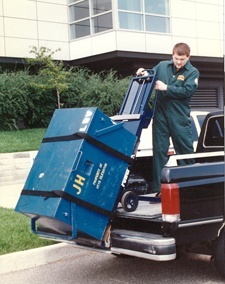 Are you moving large vending machines or high-end appliances? Ask about our PowerMate M-2B stair climber. This machine is similar to the M-1 but with eight extra inches of height, ideal for very tall loads like Sub-Zero appliances. Do you sometimes find yourself in a tight spot? Do you work in older housing stock? Add a Step Extension and Pivot Pad to your PowerMate purchase! The Pivot Pad is made of durable material which allows you to turn your fully loaded PowerMate on a dime. The Step extension gives you that 'extra' step that you wish you had when backed into a corner on tight landings. 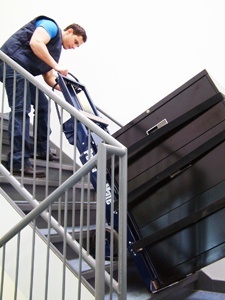 Because the PowerMate stair climber has the ability to 'skip' a step or two, the step extension allows operators maximum flexibility when working on narrow, tight stairwells. The PowerMate M-Series machines are manufactured to high standards for quality and durability. Your PowerMate is one tough machine built to perform in a demanding environment.